There were all sorts of stories (still are) to come out of Nazi Germany, and this is yet another. This one is of a plan to undermine the British economy during World War II by forging British pounds to be dropped over England. Hitler's followers were a crafty bunch and came from all sorts of backgrounds. One such follower was Reinhard Heydrich. 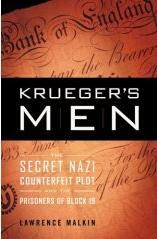 Not only did they (not only the Germans) forge currency but also other incriminating documents, passports, ration books, etc. So much money (and other valuables) was stolen during the war, from Jewish captives, to forward the war, but even that wasn't enough for the leaders. Counterfeiting was not new as it had been going on for ages and ages. However, it's not an easy operation and needs meticulous attention to detail, something the Germans were good at. John Steinbeck proposed the same idea to President Roosevelt - forge German marks. Enter one Bernhard Krueger, a young German Nazi SS officer with an advanced and methodical technical ability. This earned him rapid promotion in the SS. His orders were to begin production of British pound notes out of the Sachsenhausen concentration camp, staffed by handpicked skilled Jewish prisoners. The torture and tragedy was, as usual, excruciatingly painful to read.